Viktor Karpov: Boyovyi prapor suchasnoyi Ukrayinskoyi armiyi [The battle flag of contemporary Ukrainian Army], in Viyskovo-istorychnyi almanakh.- Kyiv, 2001. - No.1 (2). - P. 110-121. 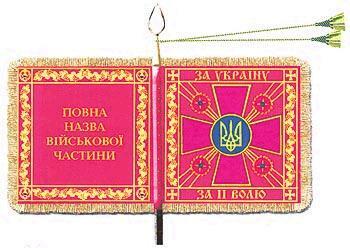 The Armed Forces of Ukraine flag was established by Presidential Decree No. 705 of September 3, 2009. This image is the Colors of the Armed Forces of Ukraine ["prapor oborozhenih sil Ukrayine"]. Land Forces flag ( Ukrainian Ground Forces (Ukrainian: Сухопутні Війська ЗСУ,Sukhoputni Viys’ka ZSU) also established by Decree No. 705 of September 3, 2009. Official website within the Ministry of Defence. The Land Forces Commander flag is actually a gonfalon as seen here also established by this same Decree, Decree No. 705 of September 3, 2009. This image is based on those. Reminiscent of Soviet Air Force flag.